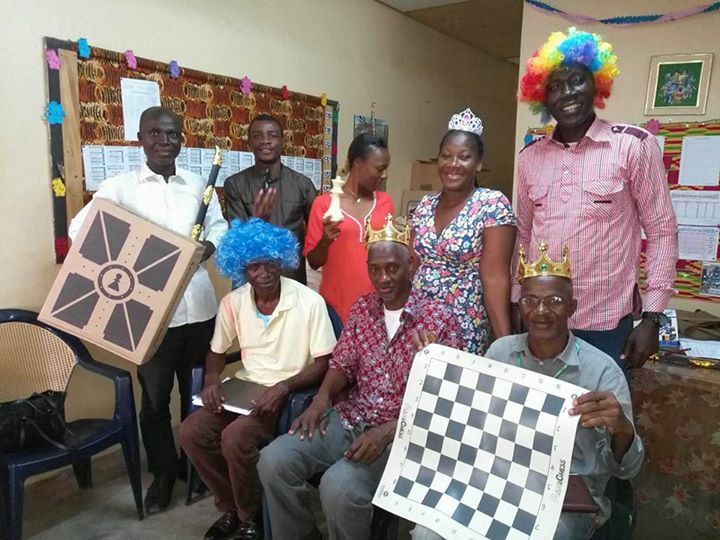 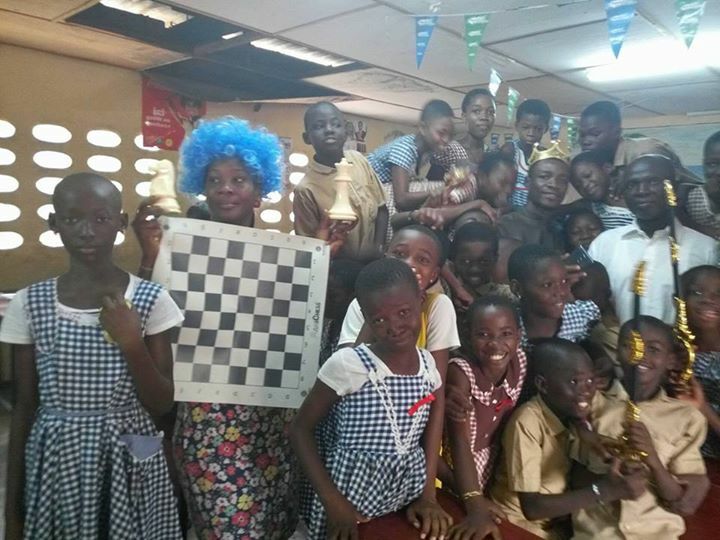 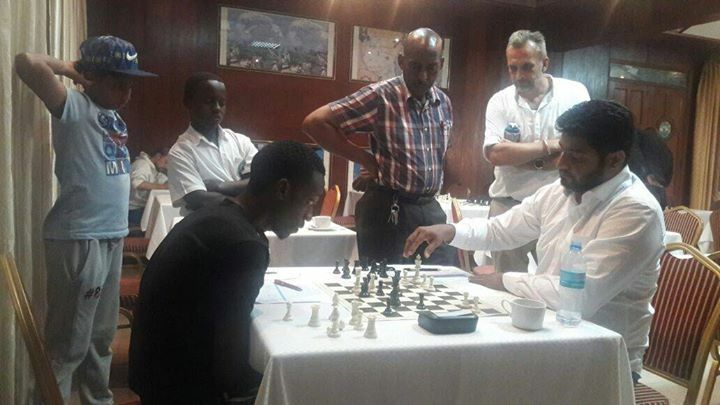 GM David Smerdon’s reflections on his recent Kenya visit show his deep interest in chess development despite his work commitments! 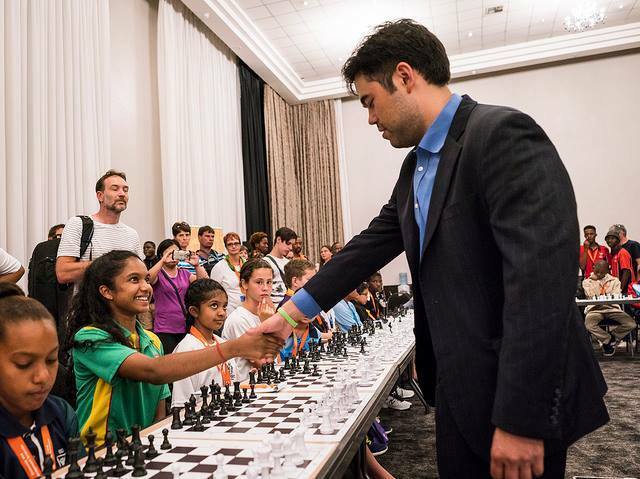 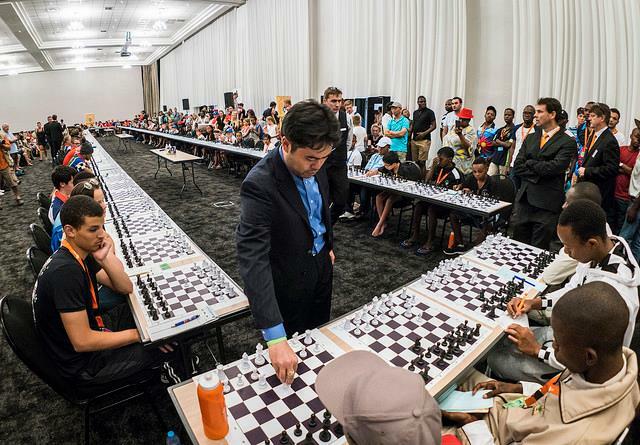 GM Hikaru Nakamura successfully completed one of the largest simultaneous exhibitions ever held in South Africa as he took on a total of 101 opponents as his last major activity associated with his visit to the 2017 South African Junior Chess Championships (SAJCC). 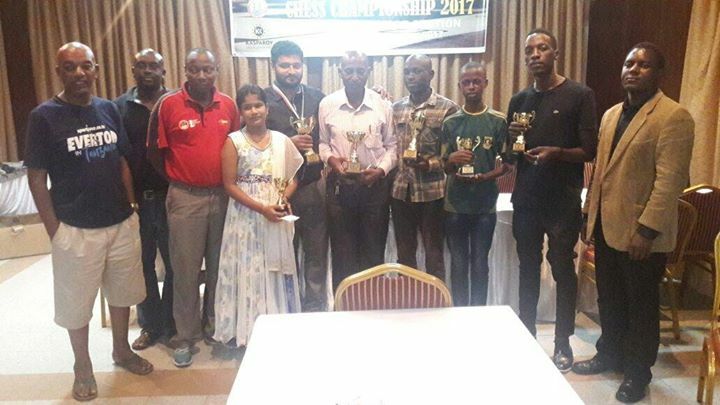 His opponents largely consisted of a determined set of youngsters including some of the best junior players in the country. 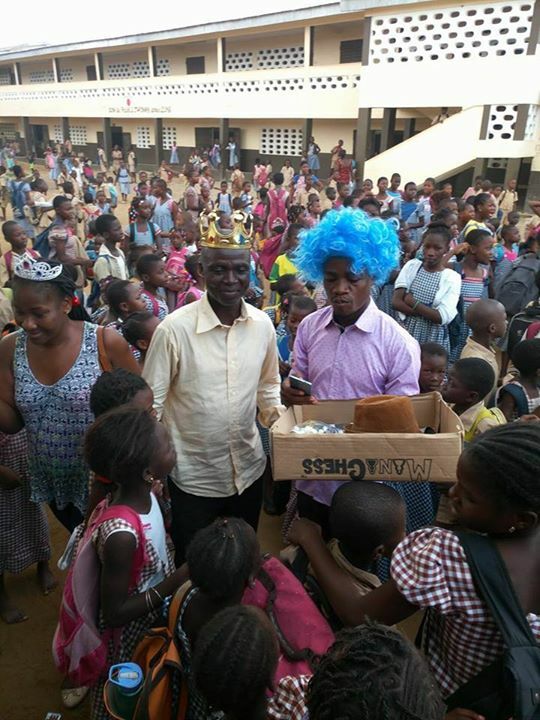 Few were willing to give him an easy ride and none wanted to be the first to finish. 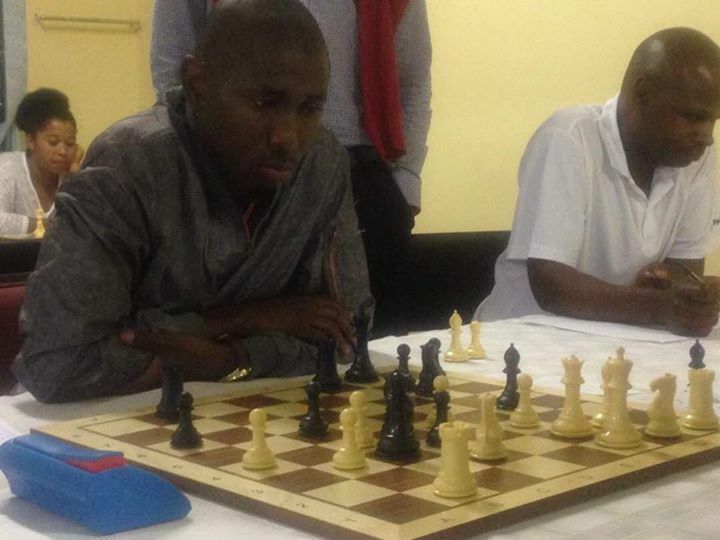 The full event lasted a mammoth 6 hours and saw Naka play in excess of 3000 moves while covering a distance of close to 4.5 km's. 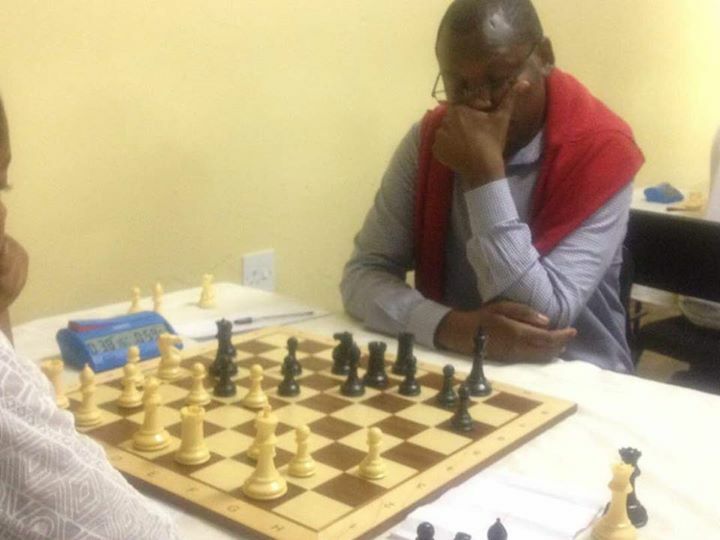 He eventually scored 92 wins and conceded 7 draws and 2 losses. 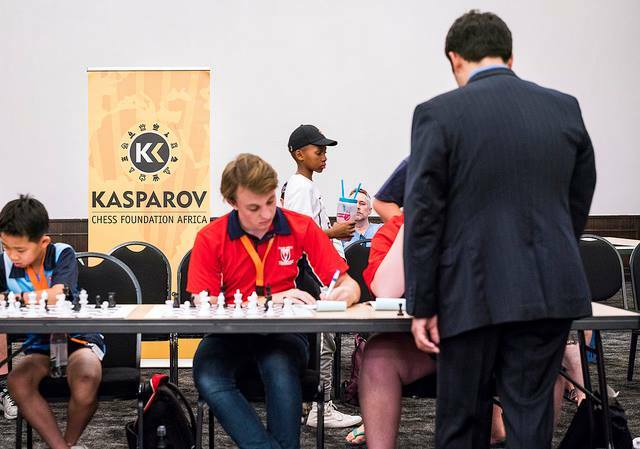 The two successful players were 17 year old Khanya Mazibuko from Tshwane and 14 year old Alexander van der Merwe from Western Province. 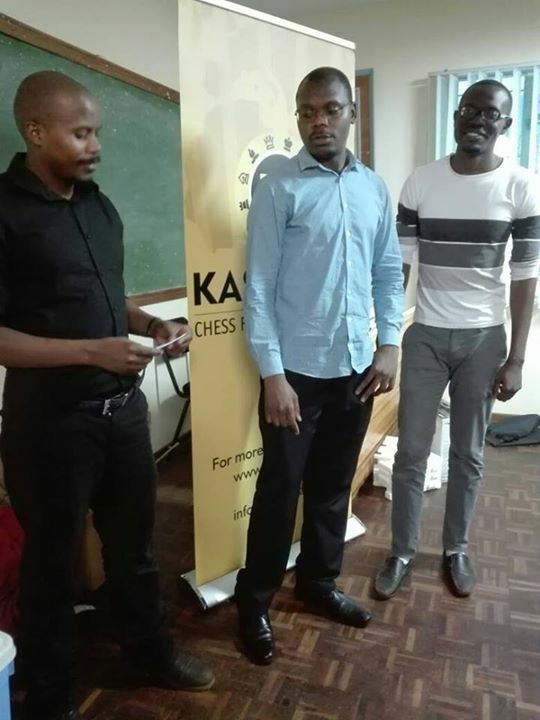 Alexander found a nice tactical combination to win his game while Khanya earned his win the hard way as he finally converted the point in the final game to finish the event. 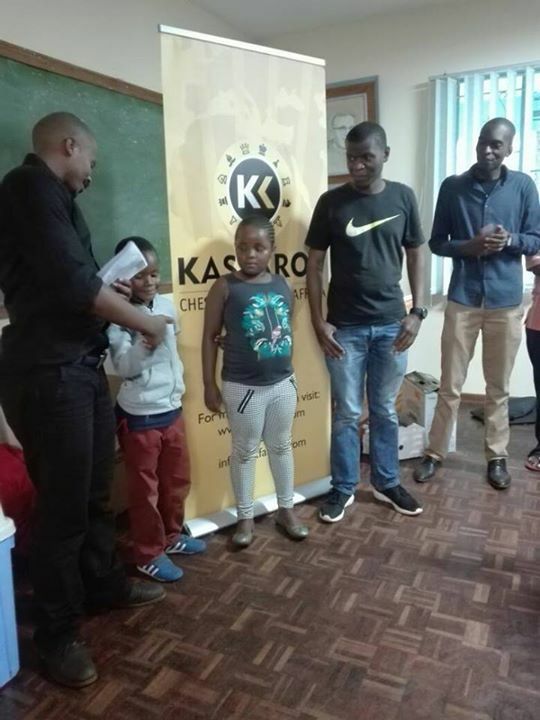 KCF Africa would specifically like to acknowledge Mr David Swartz from SWVG Attorneys for his contribution towards making the exhibition and tour a reality. 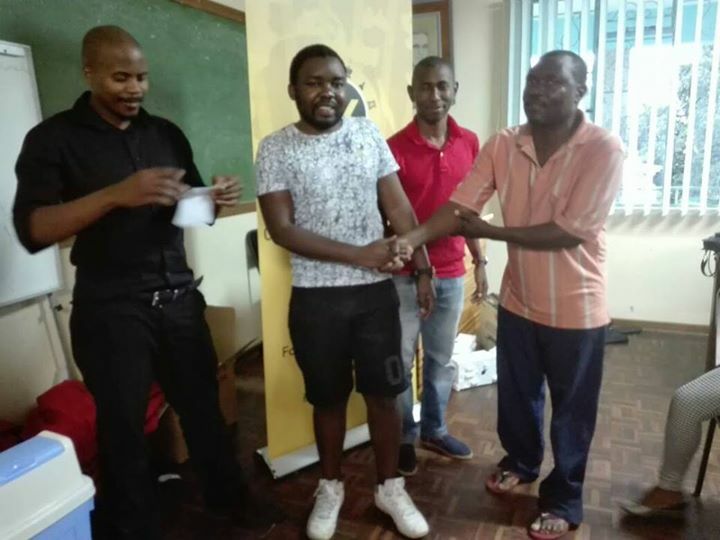 We also wish to thank Tanda Tula game lodge in the Timbavati National Park for generously offering their facilities to Hikaru as he continues to explore South Africa over the next few weeks. 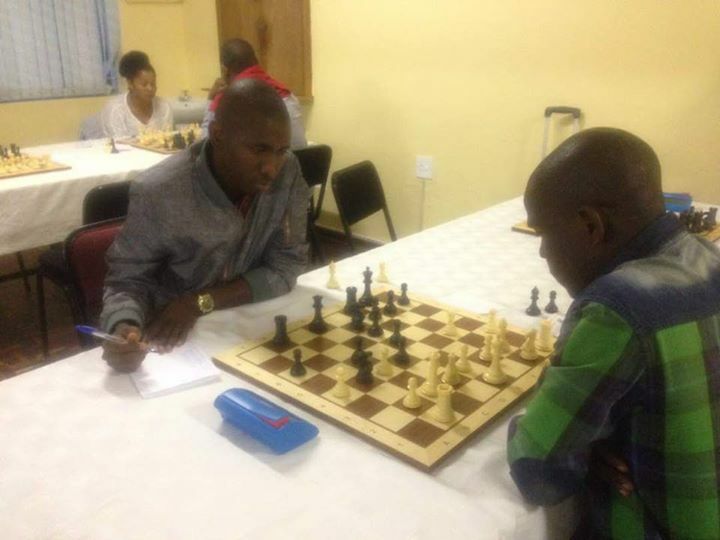 Hikaru will now remain in South Africa for another few days and will be spending some vacation time on Safari and in Cape Town before he returns to Gibraltar to defend the prestigious title he won at this tournament in 2017. 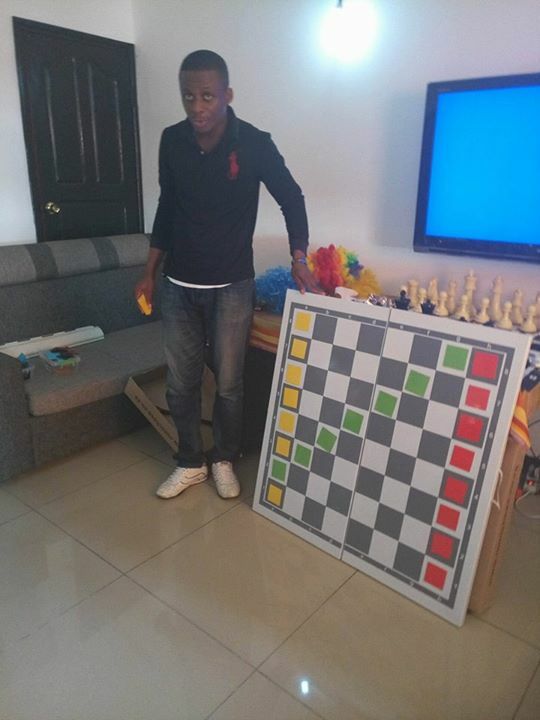 We would like to wish him luck with his title defense and we thank him for the incredible contribution he has made to the players who have been privileged to interact with him over the last 5-6 days. 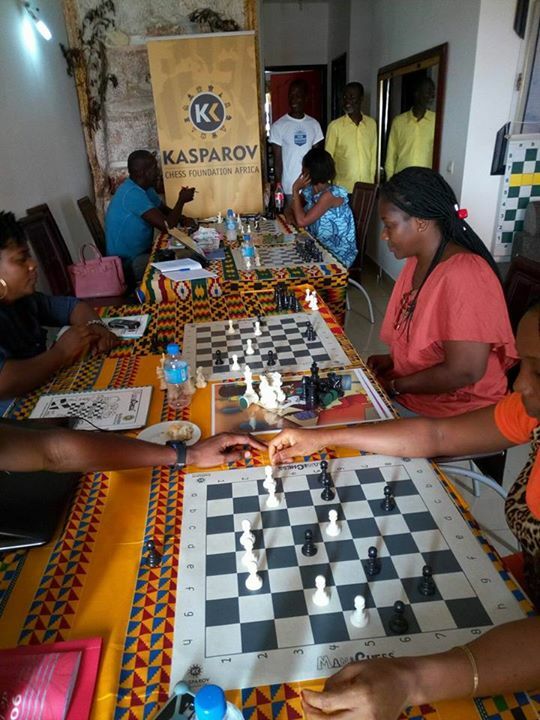 Credit for all photos goes to Lennart Ootes who has been capturing all proceedings for the 2017 tournament on behalf of the local organizing committee. 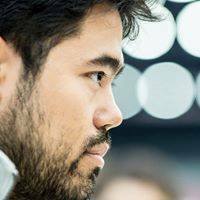 Tonight will see a historical moment as GM Hikaru Nakamura from the USA takes on World Champion Magnus Carlsen in the final of the Chess.com Speed Chess Championships. 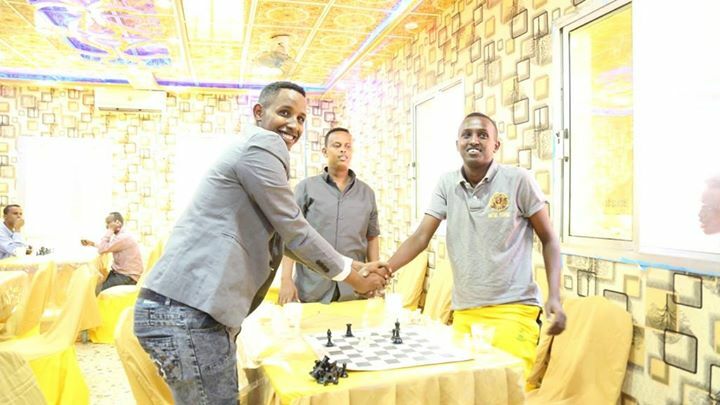 The two strongest blitz players in the world will be competing in a match which is worth $10,000 in addition to the prize money both have already won earlier in the tournament. 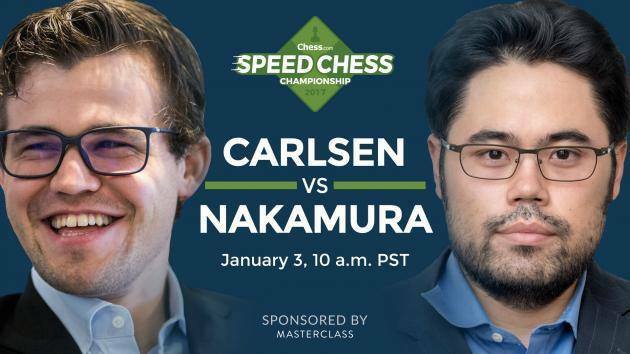 GM Eric Hansen and IM Danny Rensch will be providing live commentary for what is expected to be a record online audience. 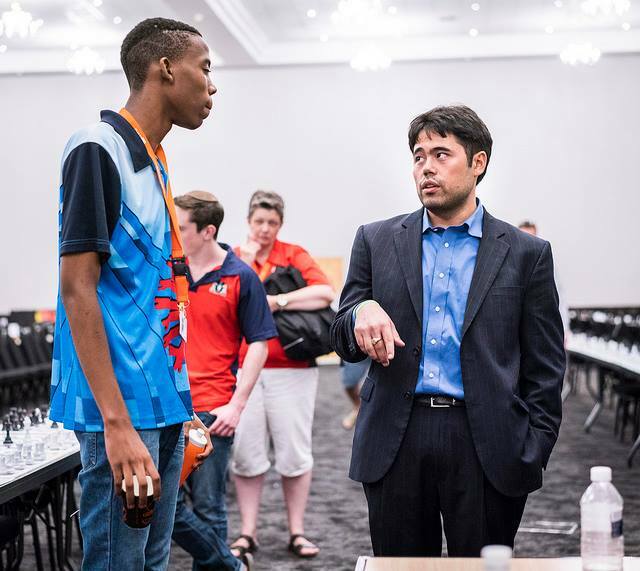 What makes the match hugely significant from an African perspective is that Hikaru is competing from Johannesburg in South Africa! 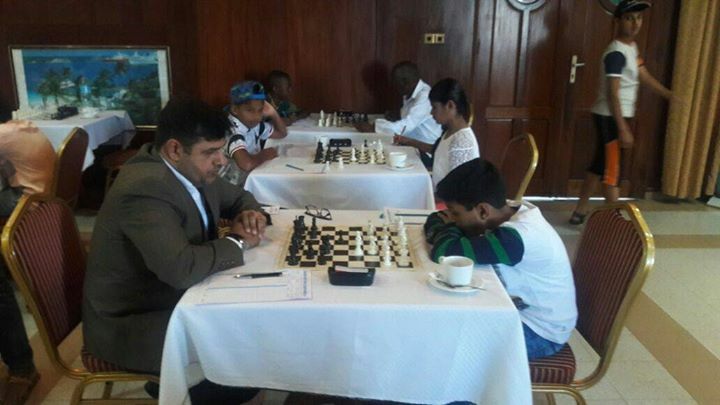 He arrived this morning and is currently based at Birchwoods Hotel and Conference Center where the 2017 South African Junior Chess Championships will commence tomorrow morning. 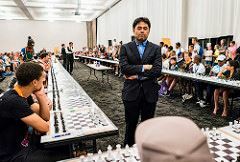 Naka will play the match live in front of a packed house in the main Auditorium and will also deliver a Masterclass and 100 board simultaneous display later this week. 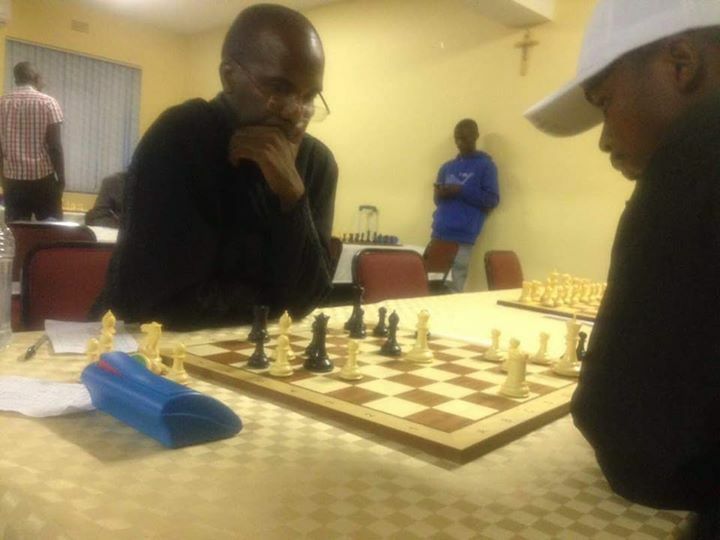 The match gets under way at 8pm South Africa time (GMT+2) and will be broadcast live on the Chess.com stream on Twitch. 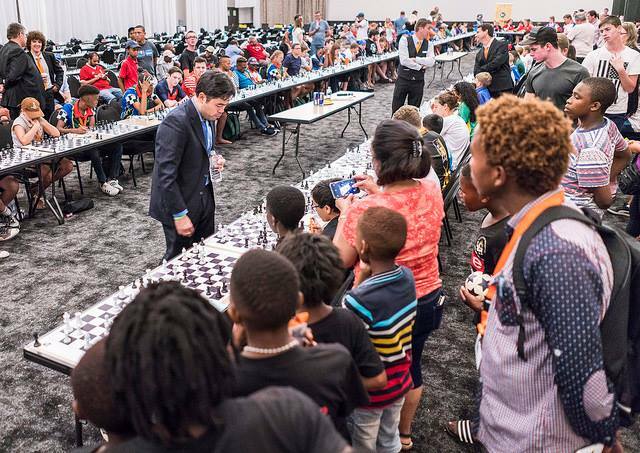 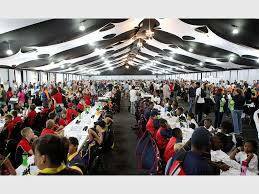 The South African Junior Chess Championships is by far the largest junior chess tournament on the African continent is expected to attract in excess of 2500 participants across the various events that run in parallel over the 9 day duration of the tournament. 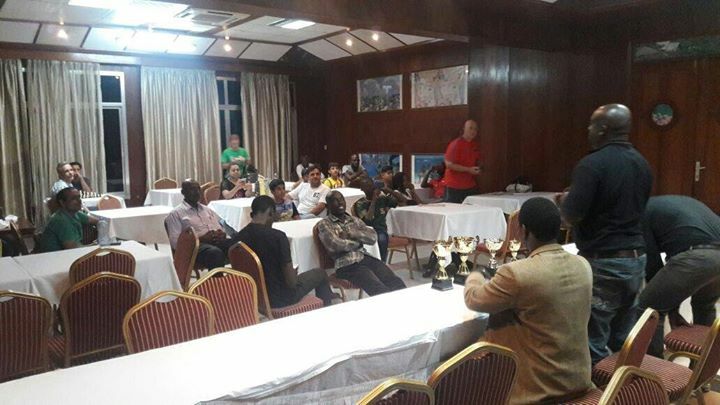 The event has been opened to foreign participants this year and will see players from Zimbabwe, Namibia and Botswana compete alongside their South African colleagues later in the event. 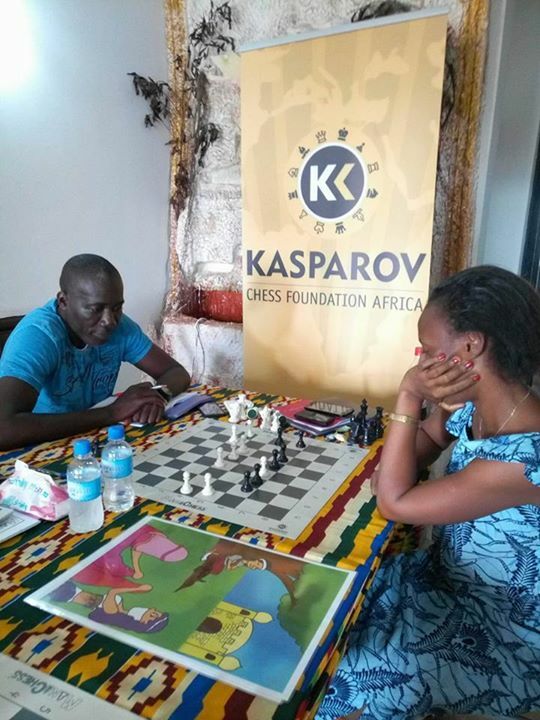 KCF Africa would like to thank Hikaru for taking time out of his exceptionally busy schedule to visit the tournament and we wish him the best of luck in his match against Magnus this evening! 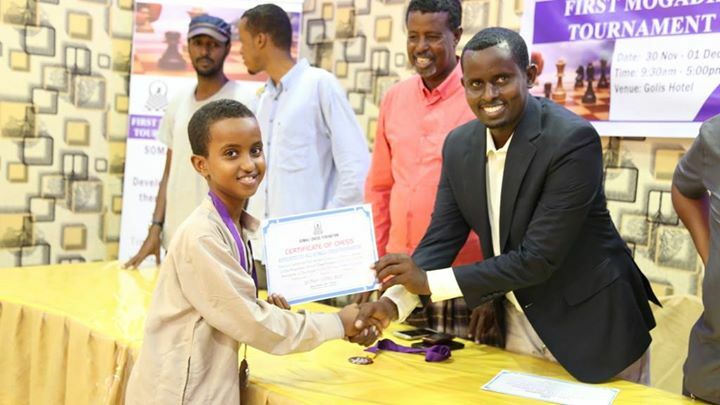 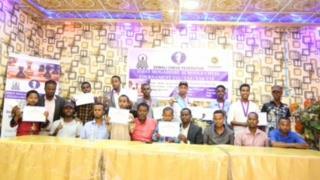 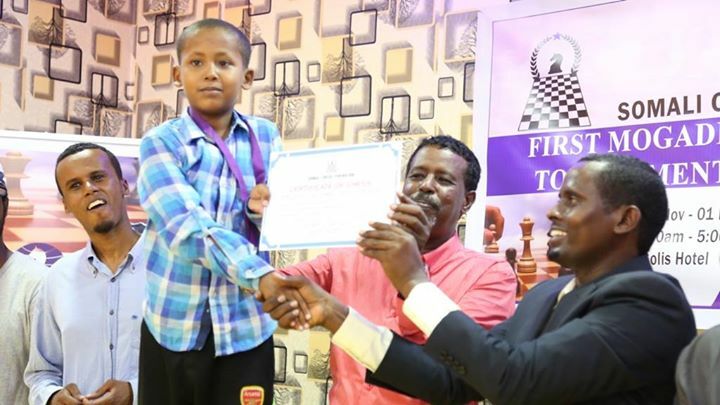 The 1st Mogadishu Schools Junior Chess Tournament was recently held in Somalia and ended on the 2nd December 2017. 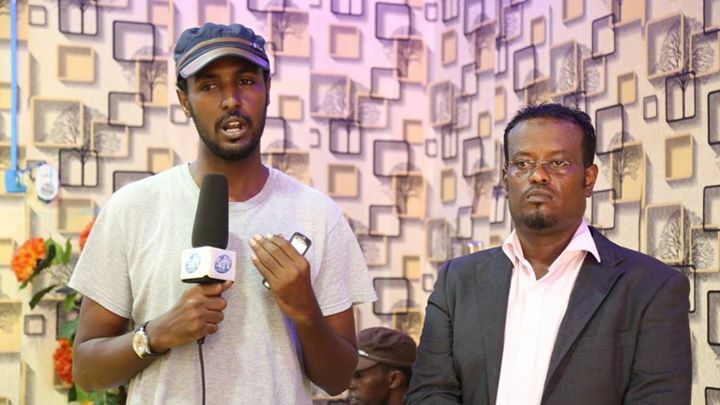 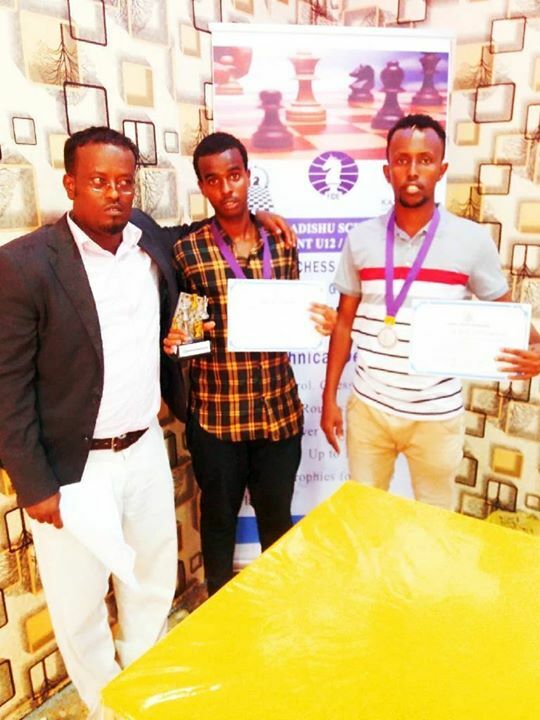 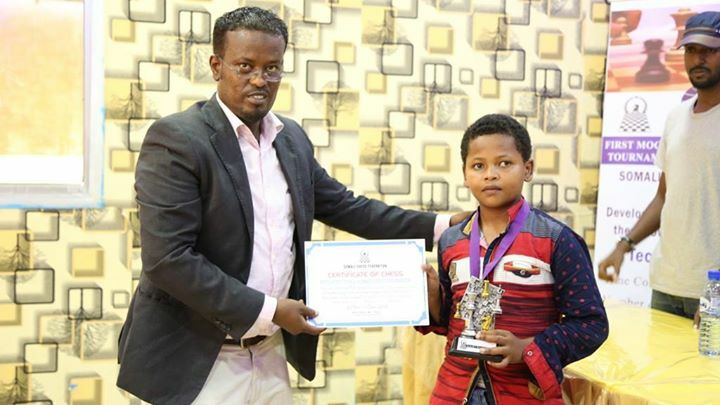 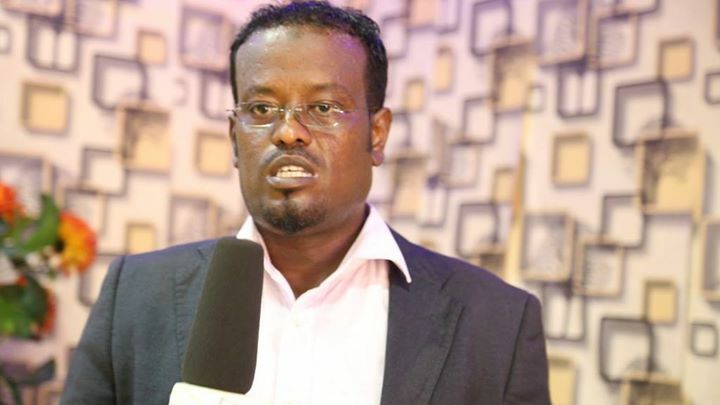 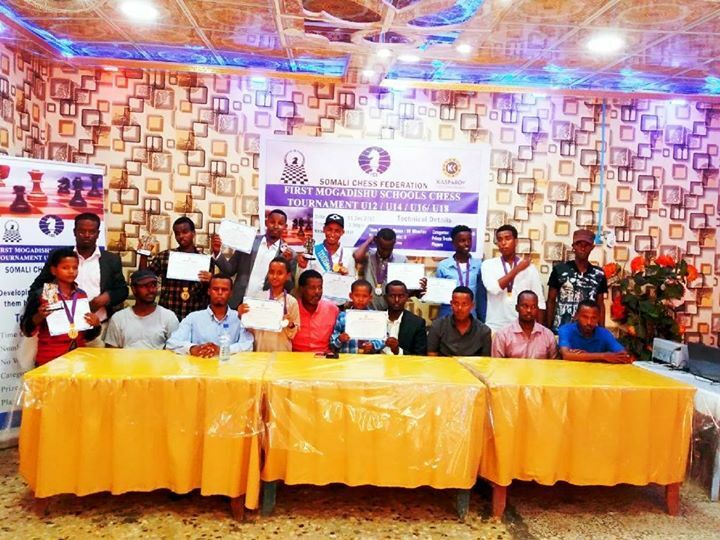 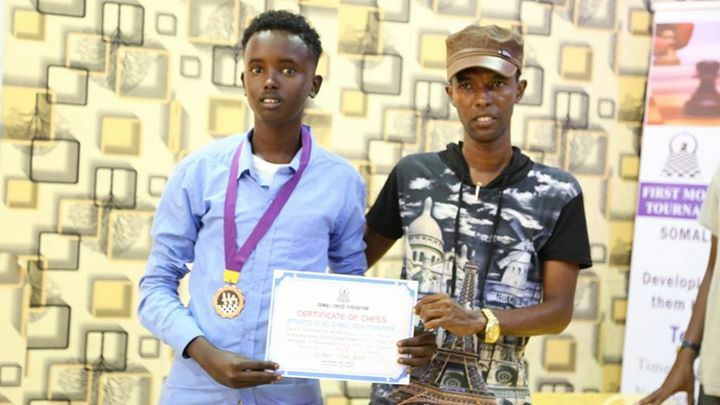 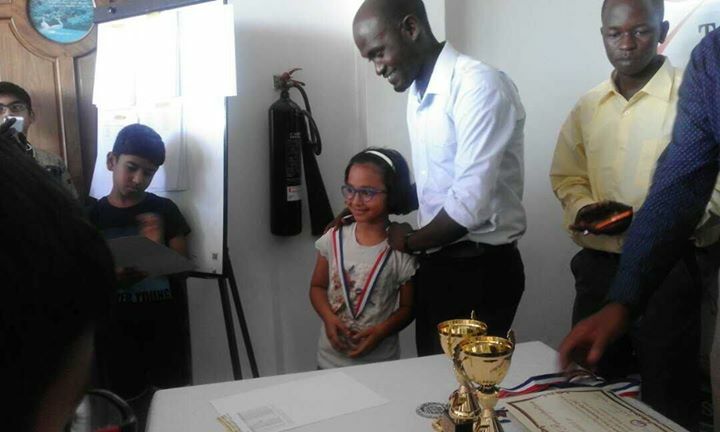 KCF Africa wishes to congratulate the Somali Chess Federation which continues to develop the game throughout the country and we hope to see some of these youngsters emerging to represent their country in the years ahead. 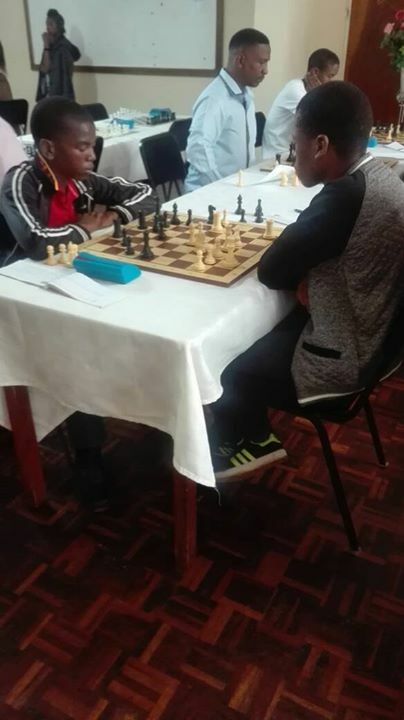 The final two rounds of the 2017 Swaziland Open were concluded yesterday morning and were swiftly followed by the blitz event which was contested over 7 rounds in the afternoon. 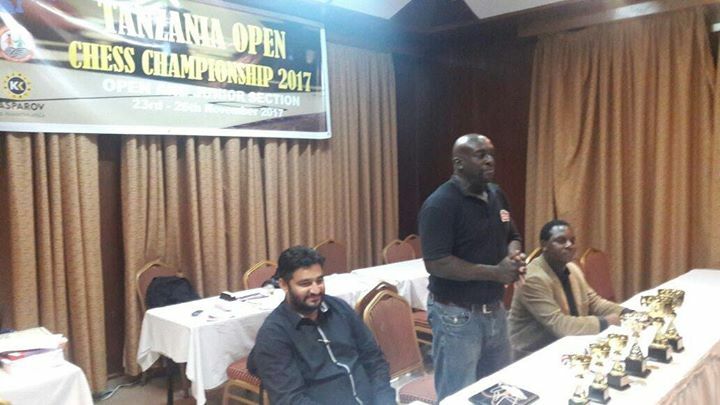 The open section title came down to the wire and was eventually shared between CM Musa Simutowe from Zambia and Joseph Mwale of Malawi. 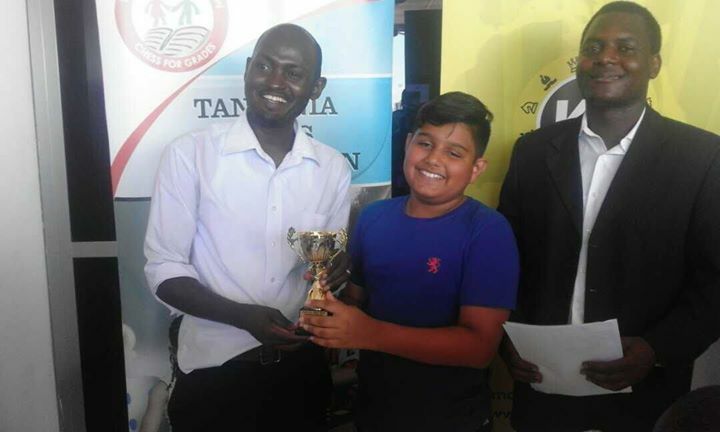 Both scored an impressive 5.5/6 to earn a share of the winner's spoils. 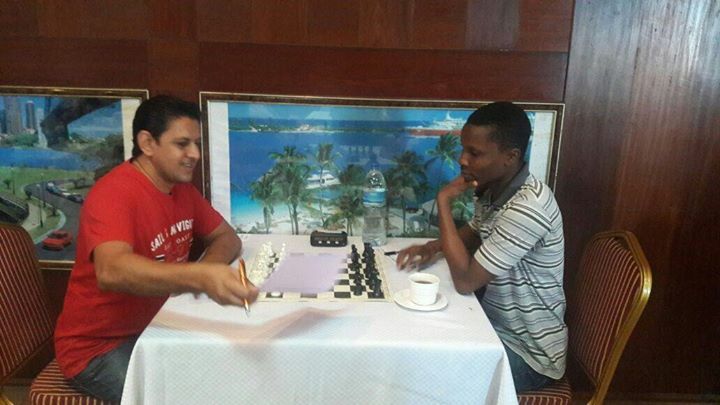 CM Donaldo Paiva from Mozambique beat his compatriot Milton Botoa in the 6th and final round to end on 5/6 and secure 3rd place on his own. 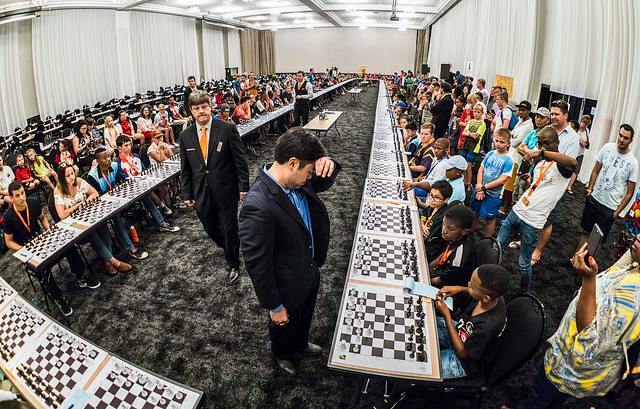 The same 4 players were to feature prominently in the blitz event as well. 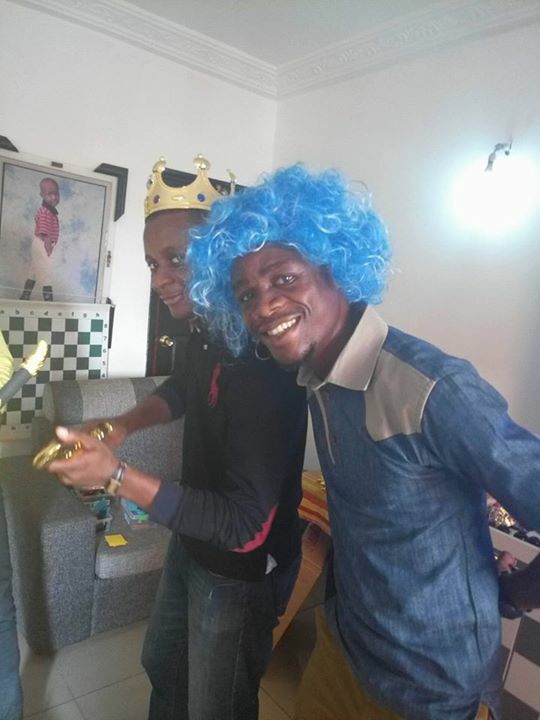 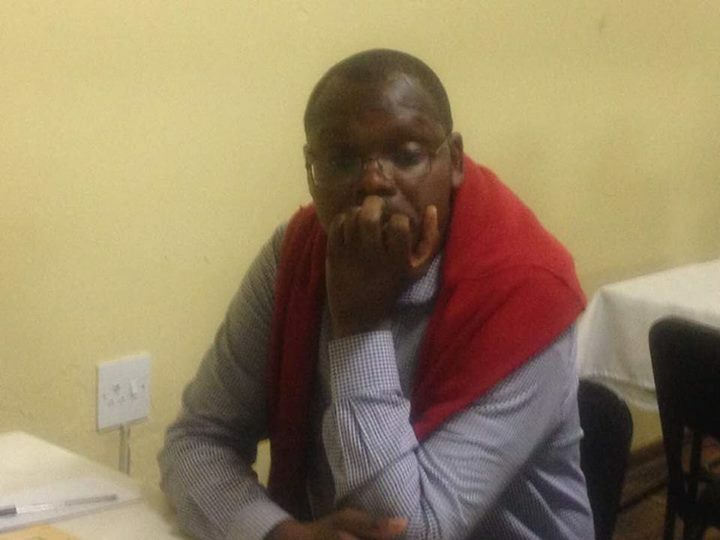 In this case it was CM Musa Simutowe and CM Donaldo Paiva who cam out on top however. 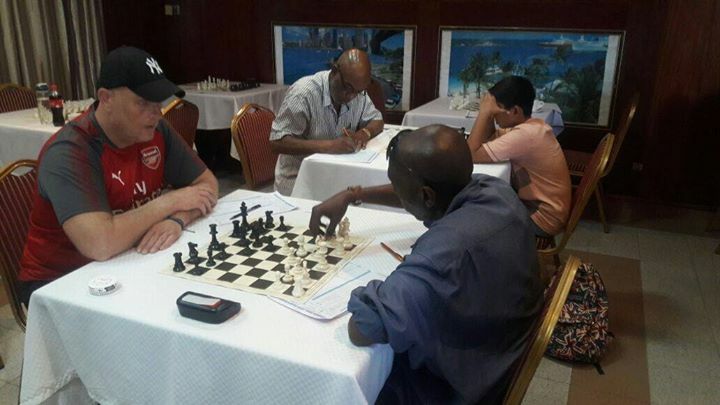 Both scored 6/7 to edge out Joseph and Milton who ended in a tie for 3rd place with 5.5/7 each. 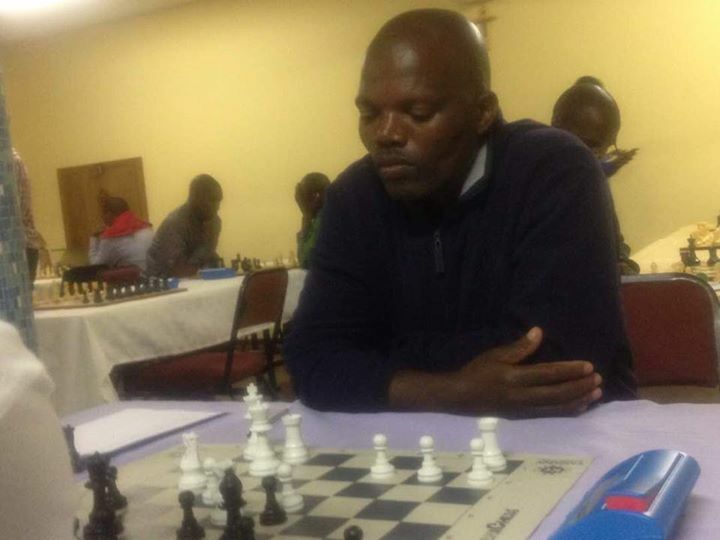 The top placed Swazi player in the open section was the consistent Fungai Matahwa who has also featured prominently in the Phela Live tournament held earlier in the year. 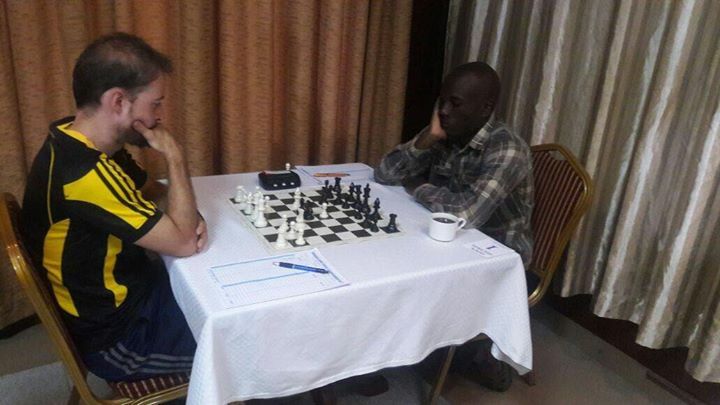 The blitz event also unearthed a new local talent in the form of Keith Dube who recorded an excellent 5/7 to end in 5th place overall in this section. 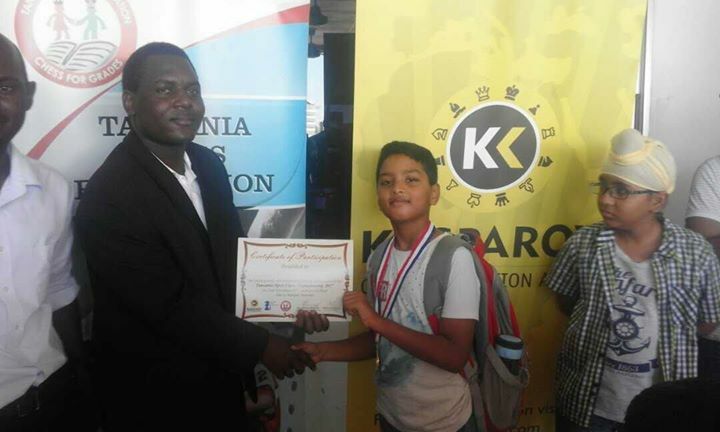 Keith is currently unrated but has immediately established himself as a player to look out for in the future. 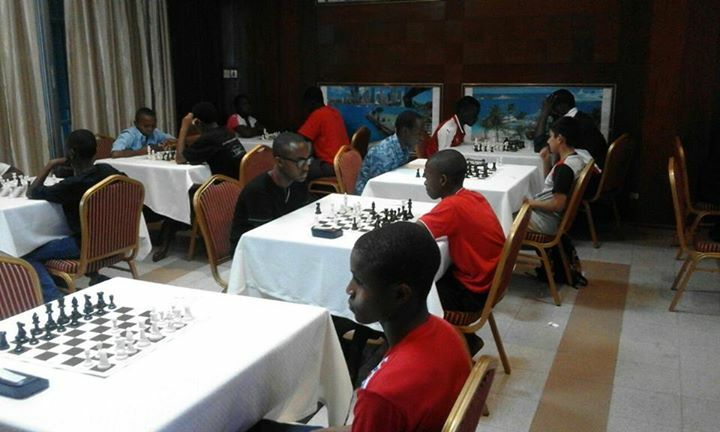 The development section was played in parallel with the main event and featured 20 local emerging players. 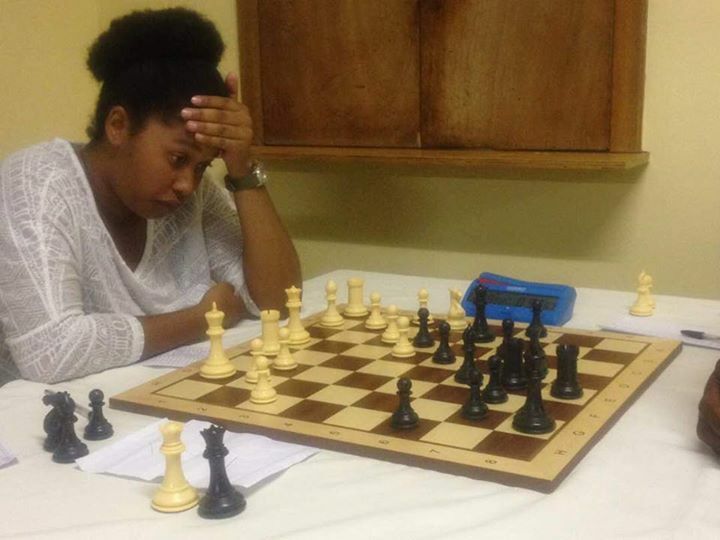 In this section, Simphiwe Dlamini and Fakudze Nduduzo shared first place with 5/6 each. 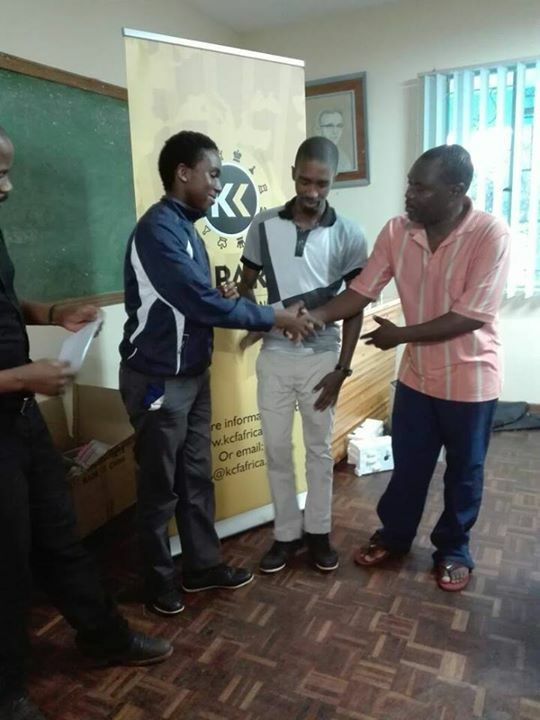 KCF Africa would specifically like to thank the Swaziland National Sports & Recreation Council for the financial support they provided to the tournament. 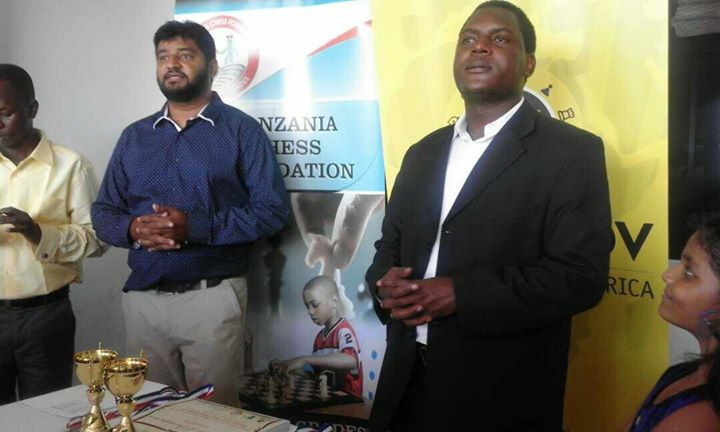 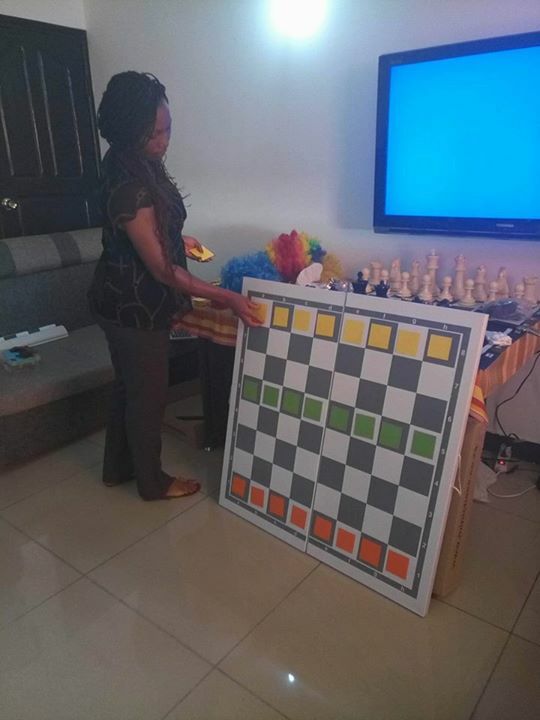 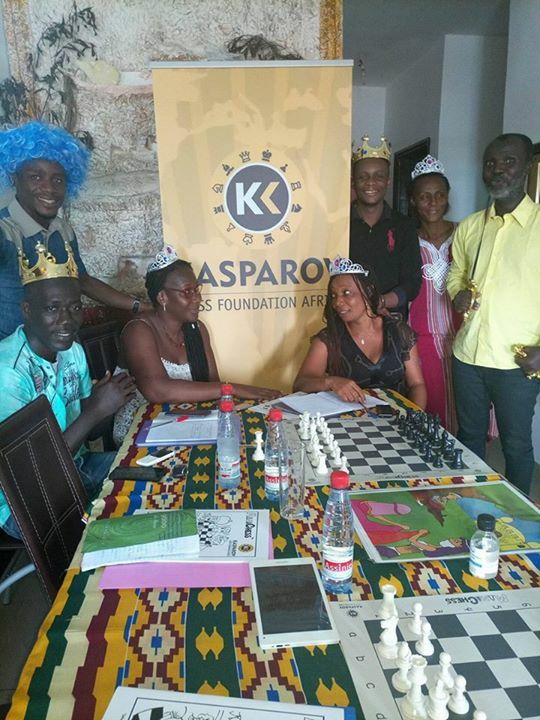 It is very encouraging to see chess receiving support at this level from the official national sports body and we hope to be able to partner with them for future events as well. 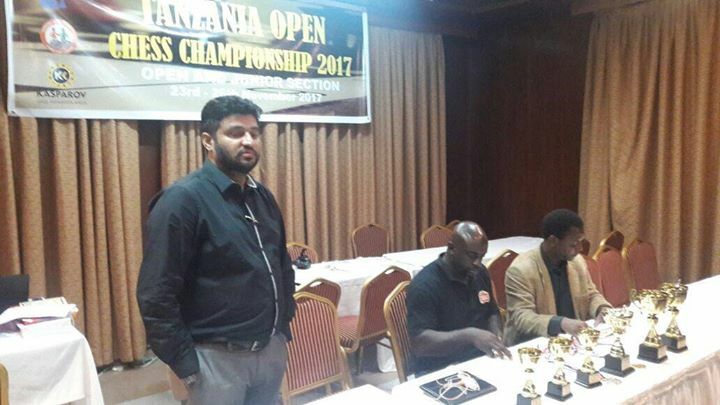 The 2017 Tanzania Open has come to an end in Dar es Salaam and congratulations are once again due to IM Elijah Emojong from Uganda. 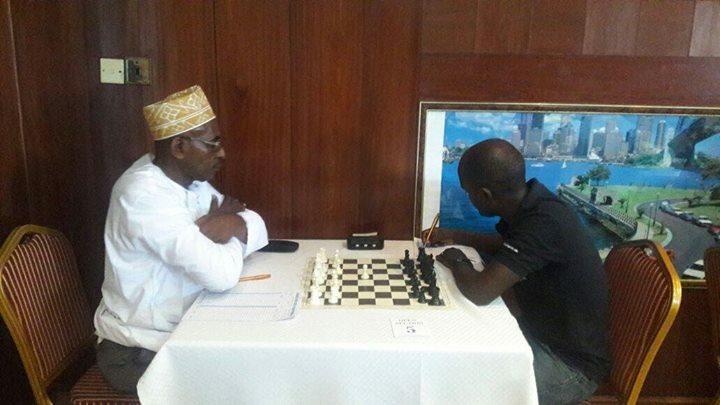 Elijah put in a dominant performance to secure 6.5 points from his 7 games and win the event by a full point ahead of local CM Yusuf Mdoe who capped an impressive outing with a fine win in the final round over Kenya's Githinji Hinga. 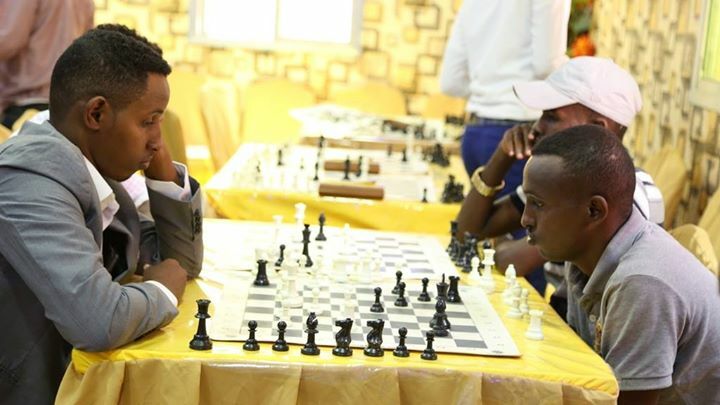 Hinga was the only player who was able to hold Elijah to a draw and had looked set to secure second place until this final round loss. 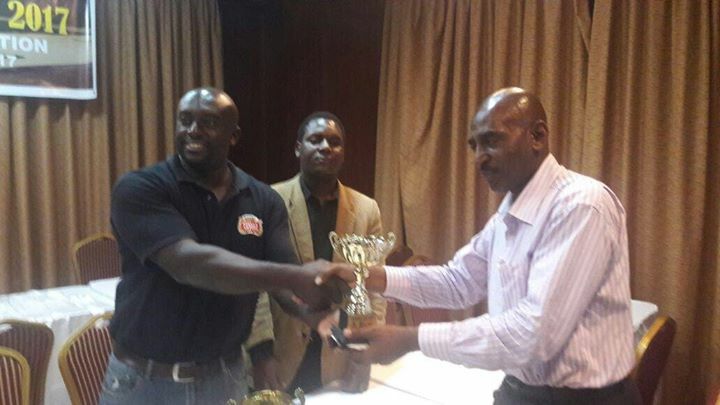 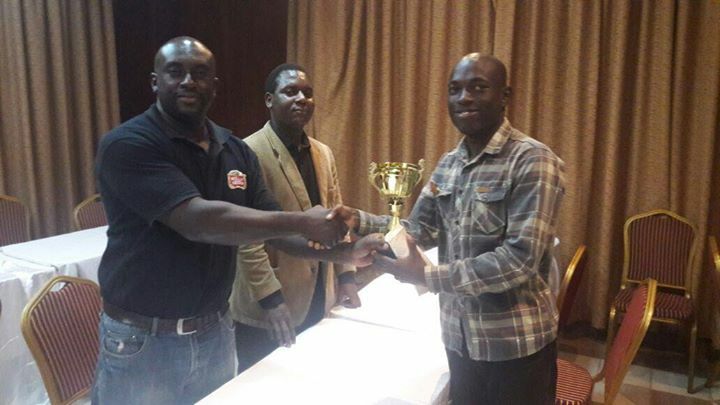 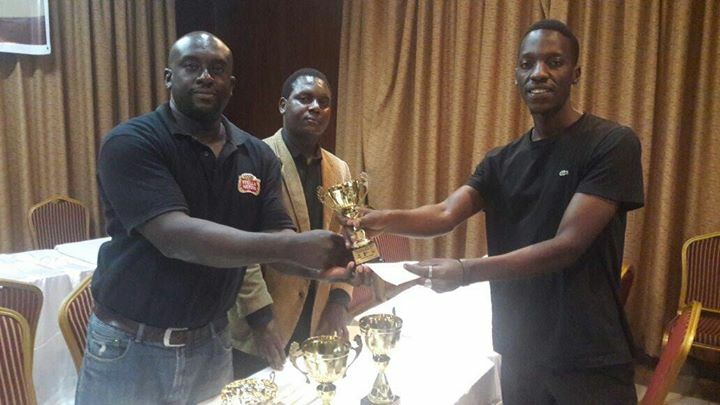 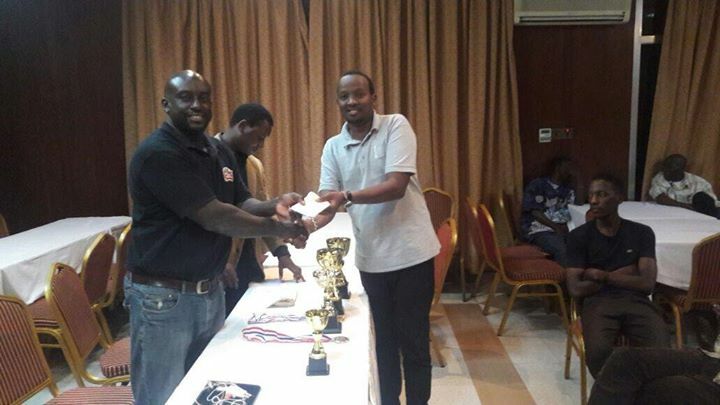 Githinji ended up in a 4 way tie for third place with FM Haruna Nsubuga but Haruna ultimately took the final podium position after winning his final round game. 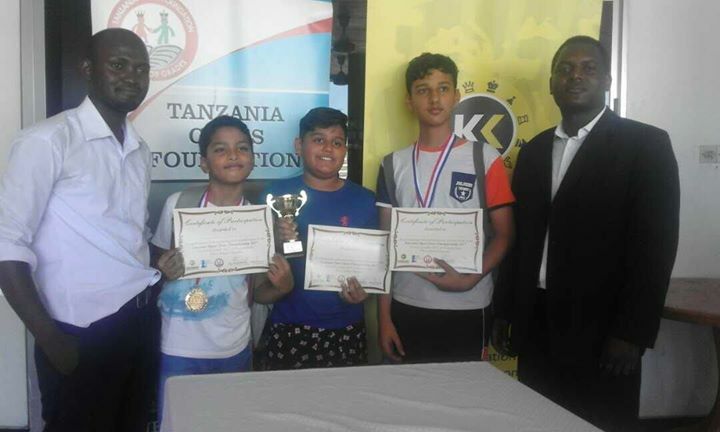 KCF would like to thank CM Nurdin Hassuji and FA Duke Machieka who together oversaw the organisation of another fine event. 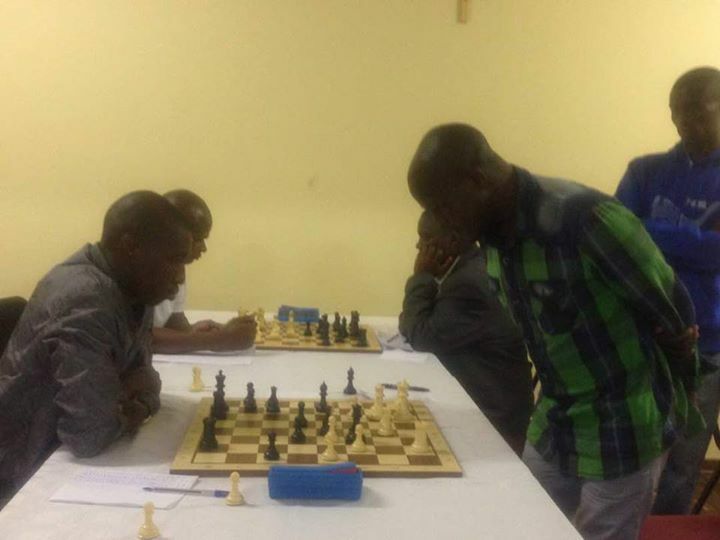 The 2017 Swazi Open is currently also under way at the St Juliana Conference Centre in Manzini, Swaziland. 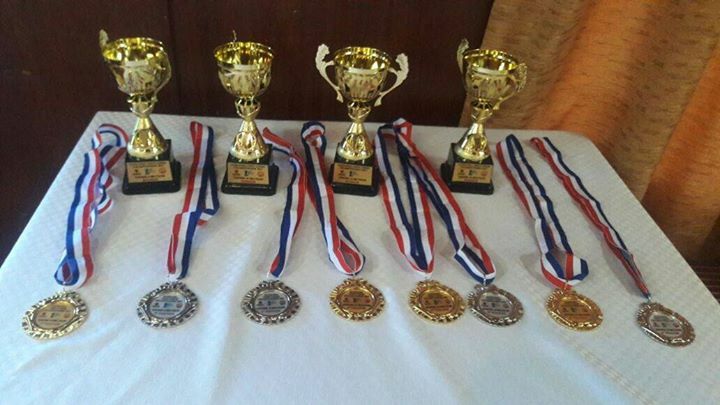 The event has attracted a record number of visiting federations (8) and see players from Swaziland, Lesotho, Zambia, Zimbabwe, Mozambique, Malawi, South Africa and Botswana participating. 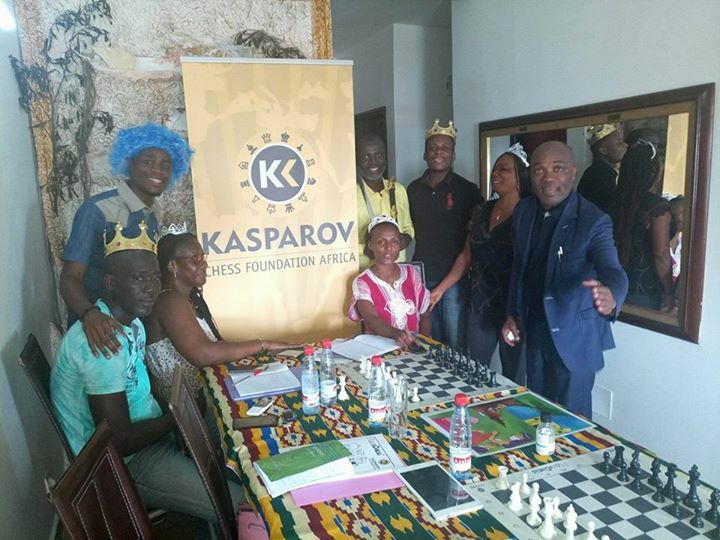 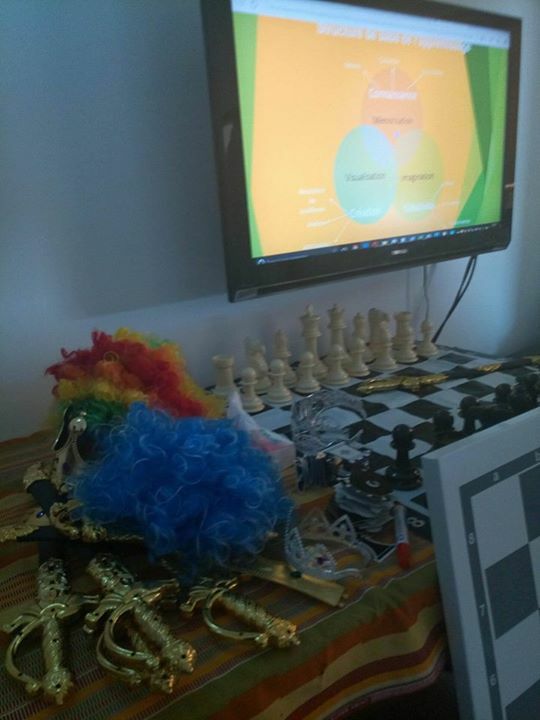 The tournament includes a 6 round FIDE Rated Classical Section, a development section, and a 7 Round FIDE Rated Blitz. 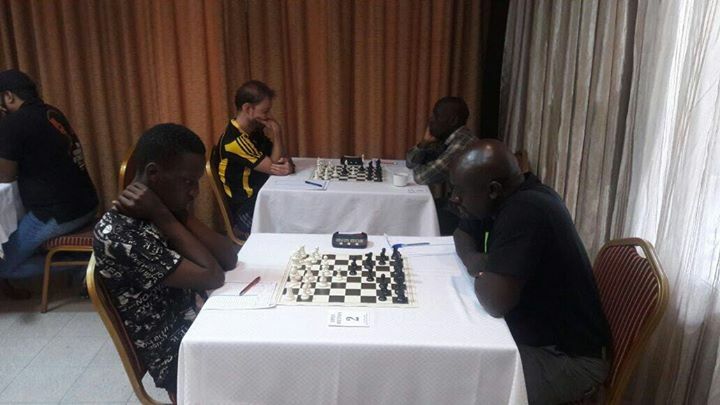 At the end of round 5, Zambia's CM Musa Simutowe and Malawian number 1 Joseph Mwale are tied at the top with 4.5/5 each. 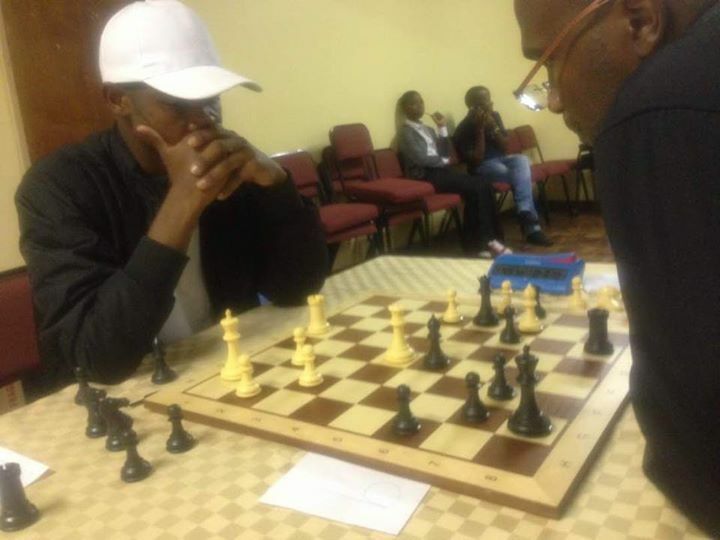 Musa will be facing off against Richard Mbedza on board 1 in the final round while Joseph has the tough task of winning with black against Zimbabwe's Elisha Chimbamu. 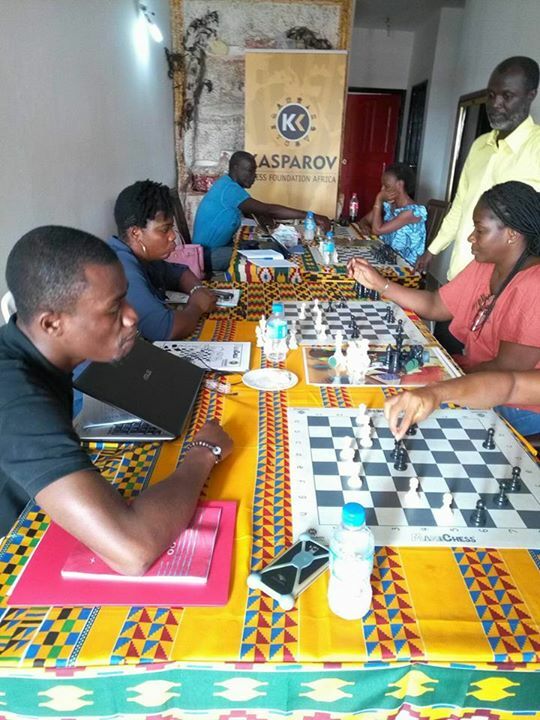 Board 3 will see a clash between the Mozambique duo of Donaldo Paiva and Milton Botao with both needing a win to end amongst the top prizes. 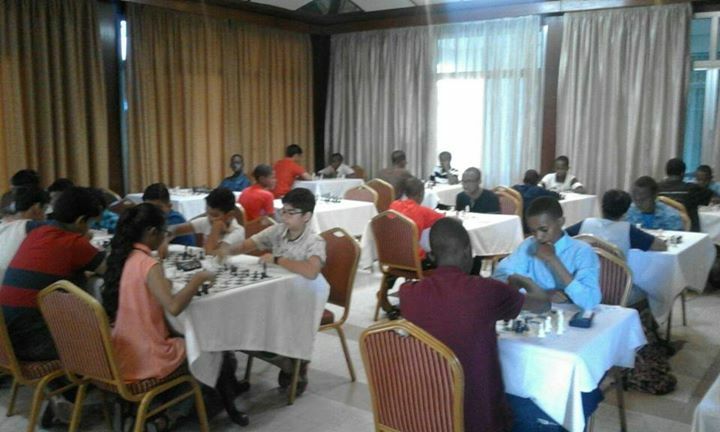 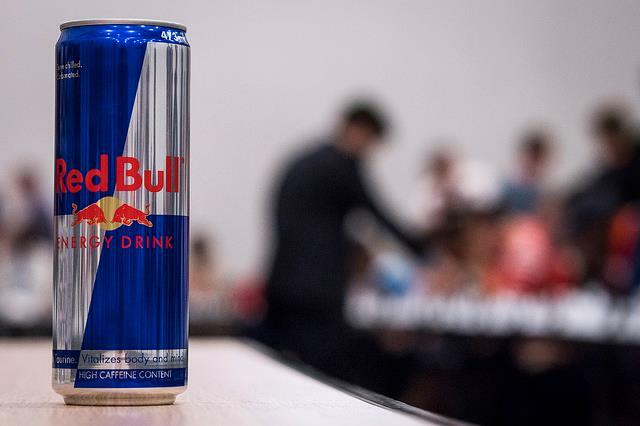 The blitz tournament will take place this afternoon as soon as the 6th round of the classical tournament is over. 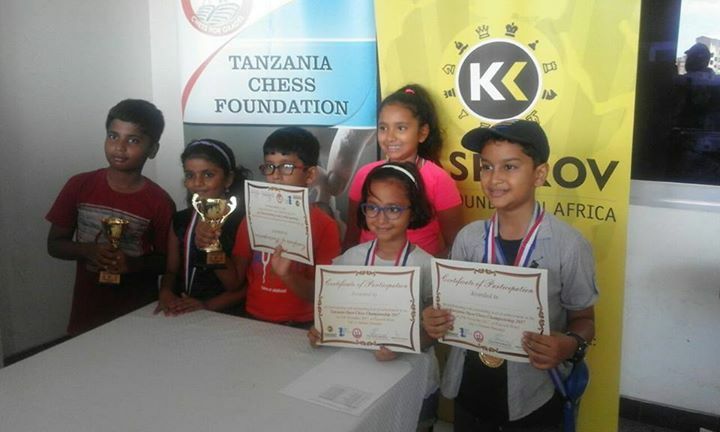 A successful day of junior events has come to an end in Tanzania and we wish to congratulate the various winners. 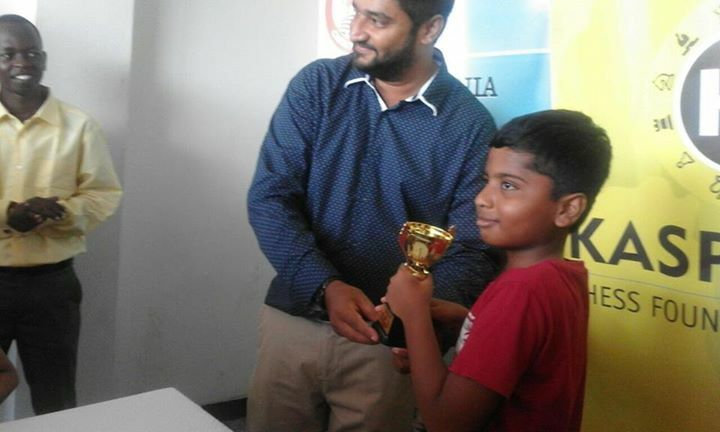 The Under 8 section was won by Ansh Sareen and Niya Vinay who both ended with 5/6. 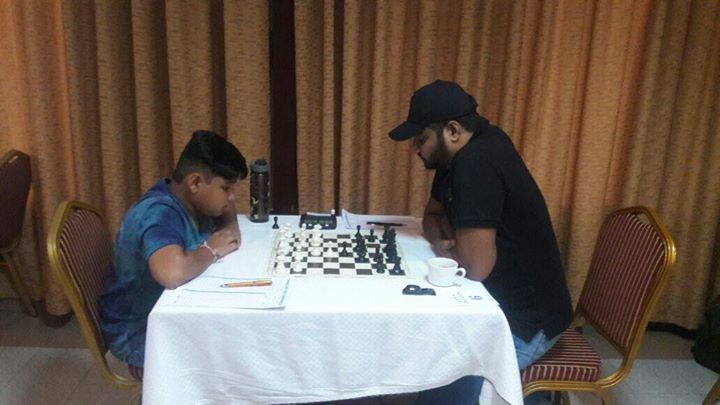 The Under 10 section was similarly shared on the same 5/6 score between Nishit Sai and Chauhan Adi. 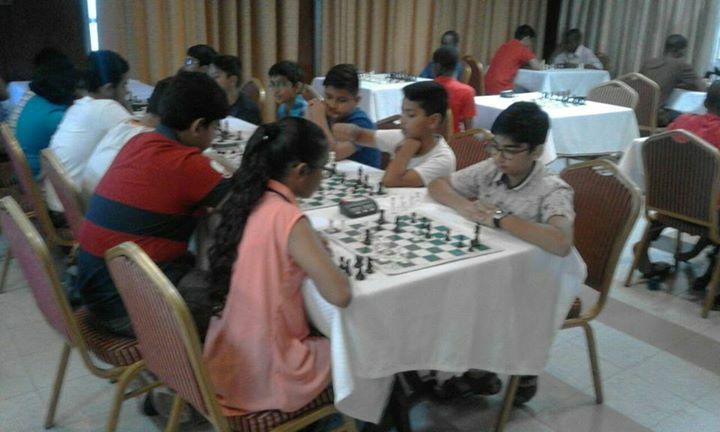 Both the Under 12 and U18 sections saw perfect 6/6 scores recorded however. 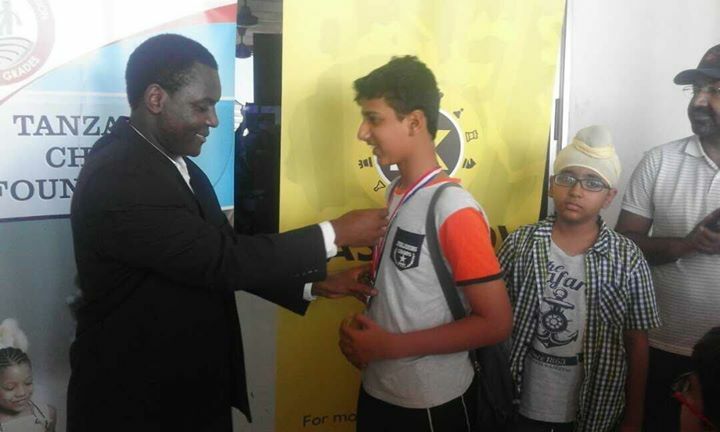 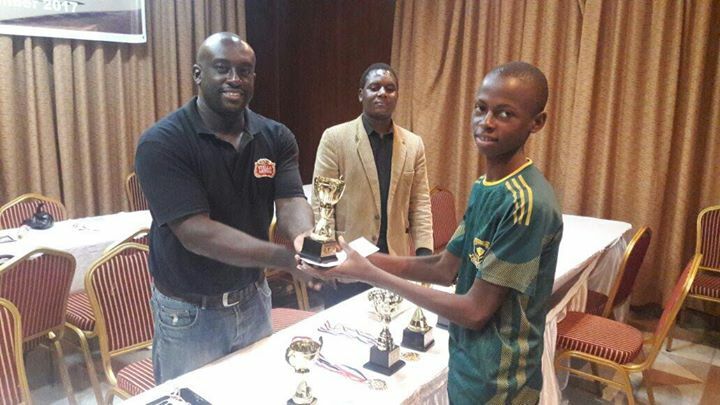 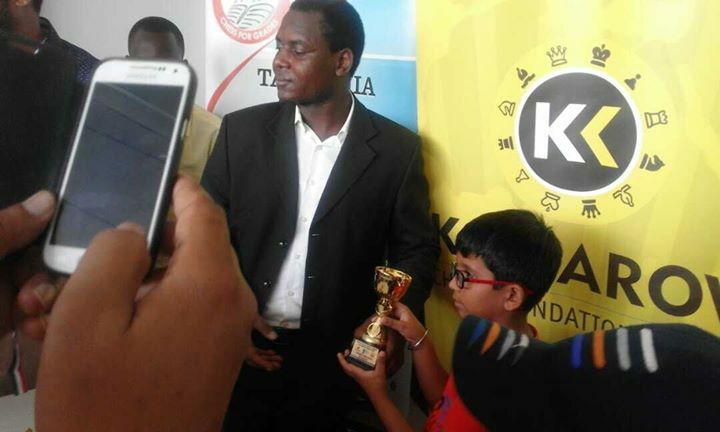 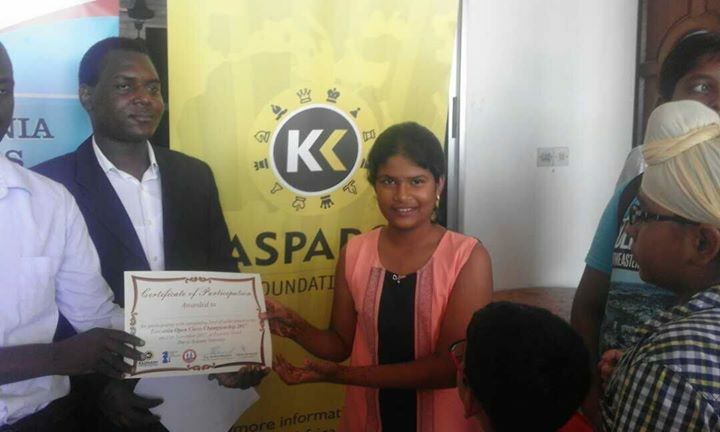 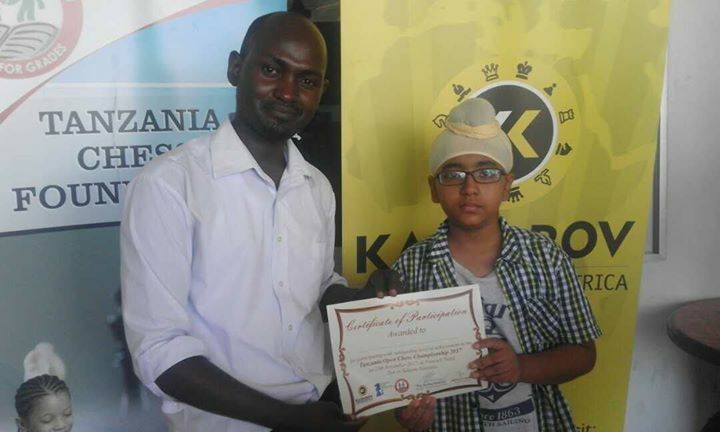 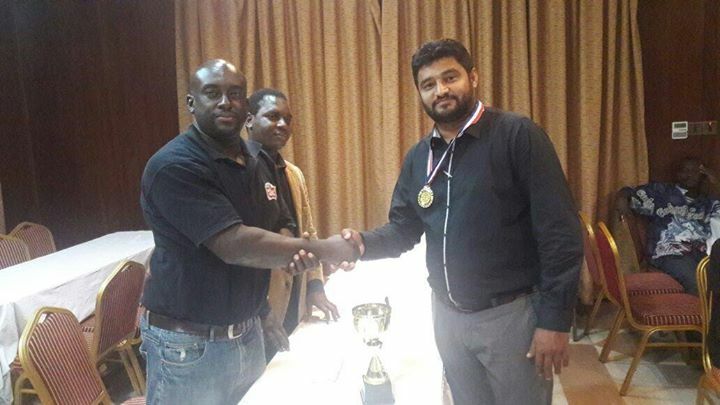 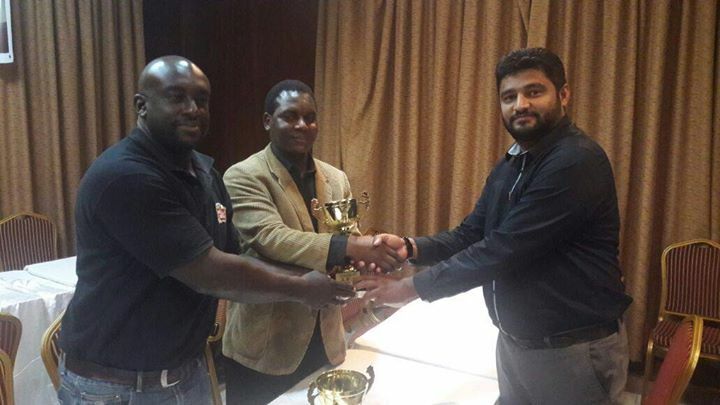 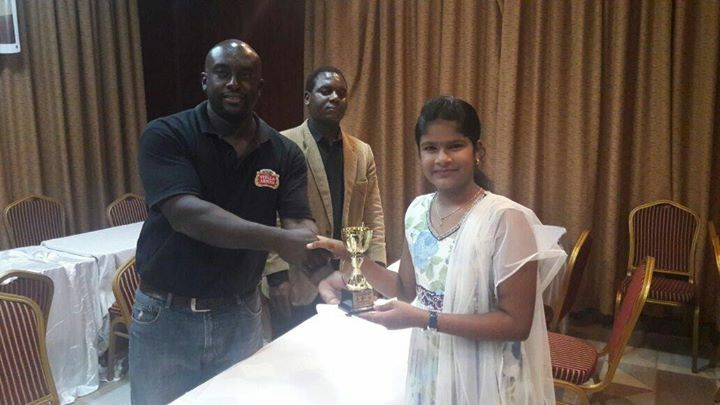 Aditya Bhattbhatt emerged victorious in the U12 section and Cleophas Charles did the same in the U18's. 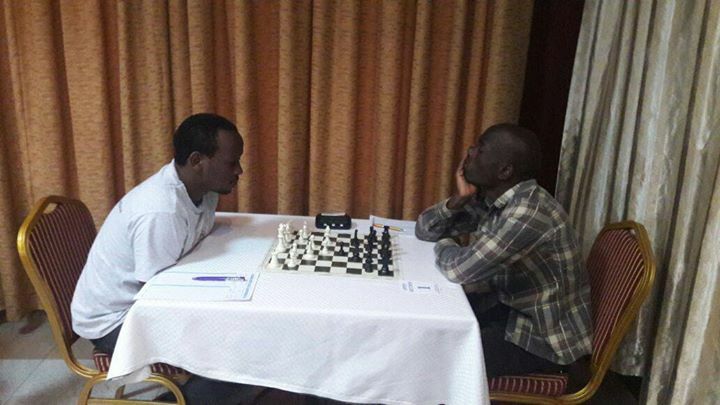 At the time of writing the key match between IM Elijah Emojong and Githinji Hinga is still ongoing and remains a tight contest. 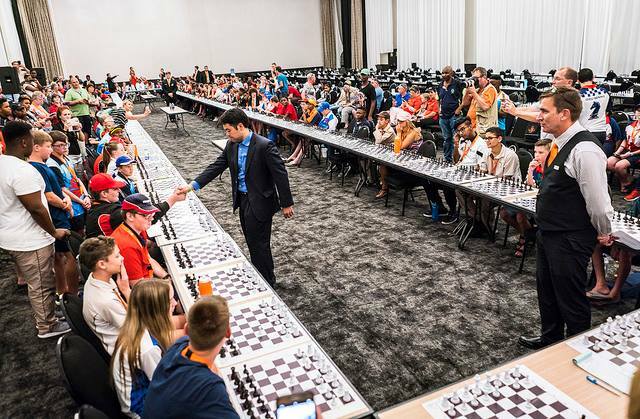 The open event will be decided tomorrow with the final round scheduled to commence at 15.30pm local time on Sunday afternoon.